Four has always been my favorite age. A four-year old understands most concepts, their language is well-developed, they are fairly self-sufficient, they are no longer a danger to themselves, etc. With the twins quickly approaching four in July, I am just waiting for the switch to begin. Honestly, it doesn’t look as if it is. 1) I am chest deep in planning the Inaugural luanch of our nonprofit for FamilyPrint on April 23rd. 2) Three weeks ago, I randomly in a fit of rage decided to take the TV away indefinitely (another blog post about this will come soon). 3) The twins have been on a destruction streak. + While standing on my beloved, L-shaped, glass-top desk in my office, Campbell drops a large marble. It clearly hit it in just the right spot because one side of it shattered. Had she fallen through she would have sliced herself open from head to foot. Thankfully, she did not. However, as soon as I saw that she didn’t have a scratch on her, I was furious. I am now unhappily typing on a hard piece of plywood that has since been written on. And, it doesn’t look nearly as sleek as my cool glass. + At the first sign of warm weather, the kids ran to play with the neighbors. Apparently, they needed a Costco-sized box of Cheerios to snack on! While I was out of sight for approximately two minutes they managed to crush the entire contents into the wood deck. If we don’t have a host of rodents swarming around our house soon, I will be in shock. + Some stickers are easily removed others are not. In an effort to bide some time while I worked on Briggs science project, I gave the girls a box of old file folder stickers. They covered the hardwood floor. Briggs and I were on our hands and knees scraping them off for an hour. + Laundry. I am not a big fan of the washing-drying-folding-putting it away process…especially after ten loads a week. But when I get it to the final stage of having all of the clothes folded to find my neat piles thrown over the banister from the second floor to the first…well it doesn’t fill me with happy thoughts. It makes me want to put the girls to bed early and lock them behind their door. + Campbell is so thrilled with writing that she doesn’t stop. With a pen and paper constantly in her hand, she writes all day. Unfortunately, she found a paint pen. Once Tim noticed a strong smell coming from the dining room, it was too late. She was just laying on the floor writing away while the paint pen leaked through to the hardwoods. Thank goodness for Mr. Clean’s Magic Eraser. The inventors have no idea how they changed the lives of mothers. + We used to have four cordless phones. We don’t even have one anymore. I am pretty confident that we will find them out in the yard as the snow melts. The list just continues. I wonder if magically on their fourth birthday they are going to change their ways. It makes me think my grandmother must really be enjoying all of this chaos up in Heaven. So our neighbor likes cars…nice cars. He now has five. They are a family of three. So we heckle him from time to time. That’s our three year old! Want a visual of me in the morning trying to get my kids out the door? Think Michael Jackson Thriller video and use this quote from Campbell tonight. She is right. I think I did growl. I dread the morning hustle out the door. Does it go well for anyone out there? What is your trick? Do you do it calmly with laughter and ease? Do your kids listen the first time you ask them to put their shoes and coats on? Do they remember their bags? Do they laugh and play with each other or hit and scream? Do they select healthy choices for breakfast or try to sneak cookies when you aren’t looking? 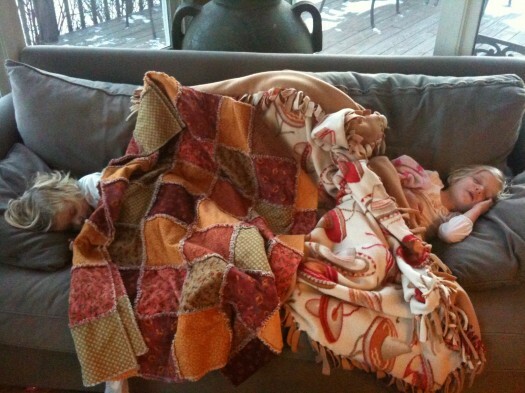 Do they plead for their blankies once you are backing out of the garage? Do you look in the mirror and resemble one of the transformed zombies from Thriller? I try not to be the mom that brags about her kids but I was downright impressed when my three year old handed me this today. 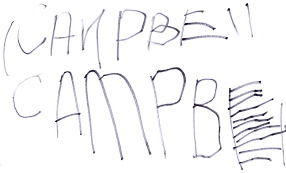 Plus, I do have three other children to compare, and none of them were writing their name this legibly at this age. Go Campbell! I know well enough that I am aging as the days quickly pass. It is evidently clear to me when I look in the mirror every morning. But the girls have started suggesting that I play the ‘grandma’ role. Of course, when the twins play “Mommy-Baby”, Campbell is Mommy, Emerson is baby, and I guess now I am getting prematurely aged to GRANDMA! As if approaching my forties isn’t enough! But then I remembered my sister-in-law legitamely had four kids by the time she was 21 and a REAL grandmother by forty. So I didn’t feel so bad. I will keep pretending to be FAKE Granny…at least they are handing me a FAKE tall, skinny vanilla late and cookie from their FAKE kitchen. Look what Santa dropped off! 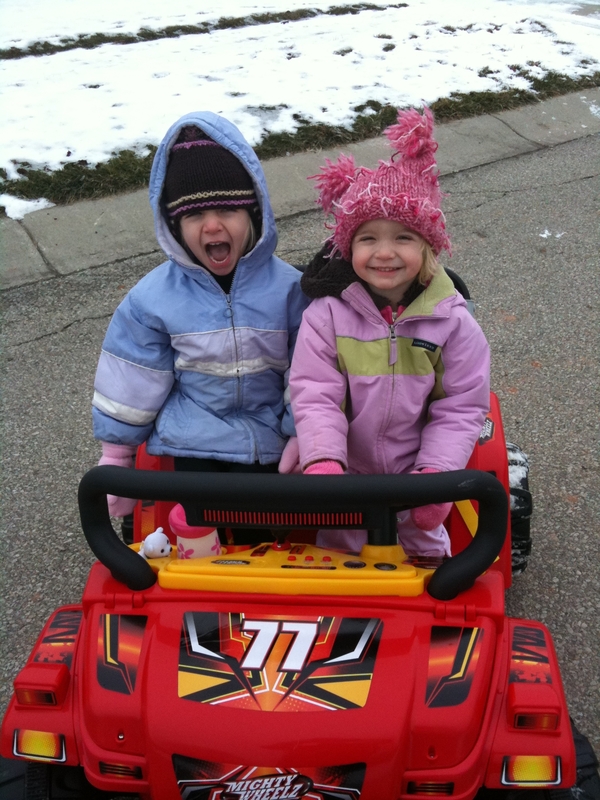 Beware…they are on the loose with FOUR wheels. IN THE MIDDLE OF WINTER…they still strip down, change constantly and wear totally inappropriate clothing given the temperatures. Don’t worry Jonas Brothers. The Stoner Sisters will never cast a shadow on your limelight. There clearly is no singing or dancing talent to be had. Just a lot of noise and interesting guitar movements. Note: Turn down your volume. It has been a long time since I last posted. I have been busy and preoccupied. However, I have oodles of posts to write. I just have to get a few of these lines down. 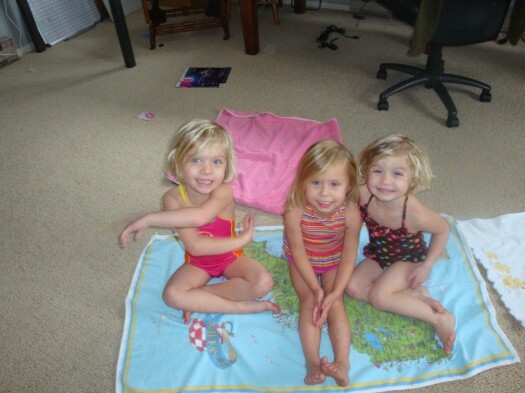 After a game of ‘Mommy – Baby’, Campbell and Emerson were sitting at the table for a snack…which let me explain is rare…they are usually running around eating a snack, leaving a trail of crumbs behind. It is NO wonder why I have a sigificant ant problem this year. Campbell is like a voice recorder. She sounded so much like me, I was scared. Within one swift conversation she took all of my threats from the day and lumped them into one.